Photos from Jane McLean, no reproduction without permission. 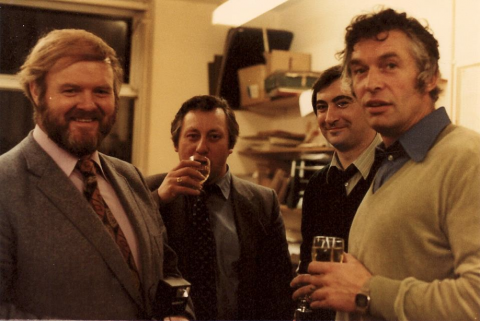 The photos are from Maggie Walne’s (nee Kidger) leaving party, from ‘Pebble Mill at One’. It looks as if the party was held in the Pebble Mill Bar. Back L-R: Carol Morgan and Judy Hill’s husband (Roy Winston); Maggie Walne with arm around Dave Williams. Steve Weddle at back. Clare Stride in front of him. John Stride with beard. It is Mick Murphy in the dicky bow. Sitting L-R: David Walker (Lis’s husband), Annie Morris, Judy Hill, Yvonne Ackrill, me (Jane McLean) in dungarees, Ellie’s boyfriend, Ellie Lacey, friend of Maggie (Cynthia), Pam Creed. Lis Walker on floor. In the second photo are Donny McLeod, Jim Dumighan, Peter Hercombe, Bob Langley. 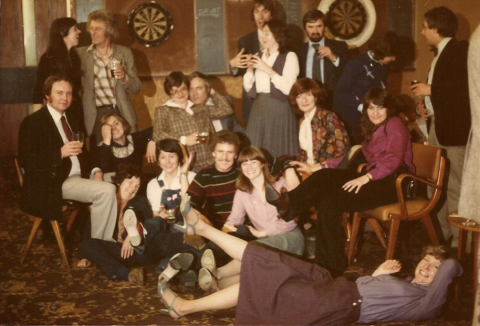 Dave Williams has arms wrapped around Maggie, Claire Stride’s husband, John, is standing next to her – I think it’d Clara Hewitt in front of Claire and I’m on the floor to the right of Jane. I’m female – I’m camera left of Jane!! That is Cynthia standing in front of me! Funny how some peoples names stick! I don’t see Clara anywhere there. Funny…all my memories of Liz Walker are of her lying on the floor! !